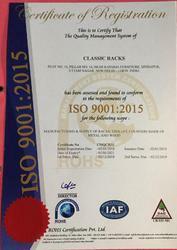 Classic Racks New Delhi, India is established in the year 2003. We believe in providing them the best possible accommodation to our customers. We manufacturer different types racks which are highly durable and fine-finished. Our company provides Crockery Racks, L Shape Cash Desk Counter, Book Display Shelf, Library Book Display Rack, Magazine Display Racks, Shopping Trolley, SS Shopping Basket, Mild Steel Wall Side Rack, Wall Side Wall Mount Rack, Industrial Heavy Duty Racks, Grocery Display Rack and many more. We are engaged in providing excellent service to our customers. We have highly experienced and trained workers to make the accessories according to the specifications of the clients. Our products are fabricated using premium quality materials that are tested for their efficiency and durability. We understand the specifications and expectations of travelers and accordingly offer special accommodation packages that specifically suit their budgets. We have an expert team who constantly checks the quality standards and adhere to the stringent quality measures. Our products meet international standards. We use quality materials to design our products. We also upgrade this unit at a regular time interval to meet the bulk demand of our clients within a committed time frame. We use superior quality materials for manufacturing these products. Our products are manufactured according to the specifications of the clients. We have a spacious manufacturing unit which is spread across a wide area. We upgrade this unit at regular intervals of time to meet the bulk demand of our clients within a committed time frame. Our manufacturing unit spread across the wide area in such a way to meet the requirements of the clients. We deal with our own manufacturing brand Classic Racks.